The Playstation arrived on the scene in 1995 to a lot of skepticism. Sony after all made the TV’s we played video games on, and not the video games themselves. Besides with Sega and Nintendo who needed anything else? It didn’t take long for reviewers to sing Playstations praises though, and it went from being the must miss console to the must have pretty quickly. By launch time the Playstation was a huge success and it marked the beginning of a new era in gaming systems. Now if you keep up with my blog you’ll know that I was a “bit war refugee” who sought a home in PC gaming in the mid to late 90’s. To me the SNES vs Genesis fight and everything that came after was something I was oblivious too, and rightfully so since it was the golden era of PC gaming. But, having to boot up a computer and wait for stuff to load, and all the other crap that goes along just trying to even start a game on a PC got to me and I began to think about the ease of playing a game on a console. By 1998 I gave some small consideration to buying a console for myself, but it was the 1998 JC Penny’s Christmas catalog finally got me serious. The picture in the catalog was for a game called Gran Turismo and being a young man with an interest in cars it was an essential. By early 1999 Playstations where selling for about $99 and I grabbed one from a local Best Buy, making sure to buy Gran Turismo with it. To say the least I was floored by the gameplay and Gran Turismo became a go to game on lazy days off. For Christmas of 1999 I would get Gran Turismo 2 as a present, and it had me from the beginning with The Cardigans Favorite Game during the intro sequence, as well as the rest of its phenomenal gameplay and soundtrack. I spent a lot of time on that Playstation, although I mainly stuck to my Gran Turismo titles. 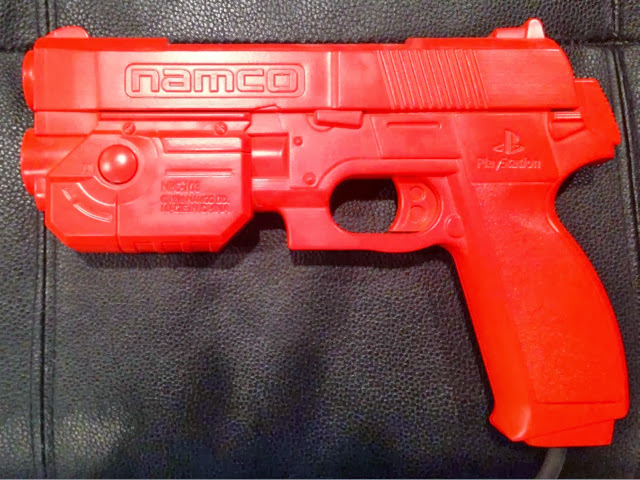 However, I do remember spending part of my 22nd birthday playing Siphon Filter with its red light gun. In 2001 I got my PS2, I mainly bought it for my girlfriend (now wife) to play DVD’s on, but it also allowed us to escape the boredom of her hometown and/or house by escaping into video games, like 4×4 Evolution, ATV Offroad Fury, and Gran Turismo 3. When we were finally under one roof I put Gran Turismo 2 in the PS2 one day and was shocked by how bad PS1 games looked on PS2. After that my Playstation now PS1 games were confined to their cases, and the PS1 hidden in the bowels of my entertainment center. 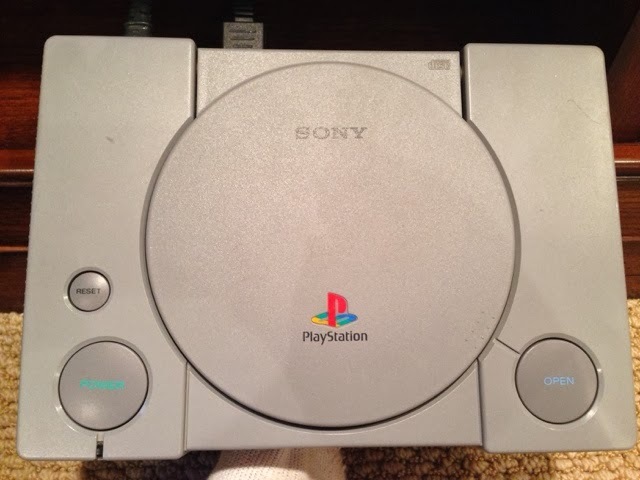 Well, if you’ve read my blog before you know I have been trying to find my old PS1, but I finally gave up. You see I did a really stupid thing and about 4 years ago, before I even gave consideration to retro gaming, I recycled several old computers and a lot of games. I think I may have placed the PS1 in with them including all my games. Well I think!! Especially since I can’t find any trace of them. 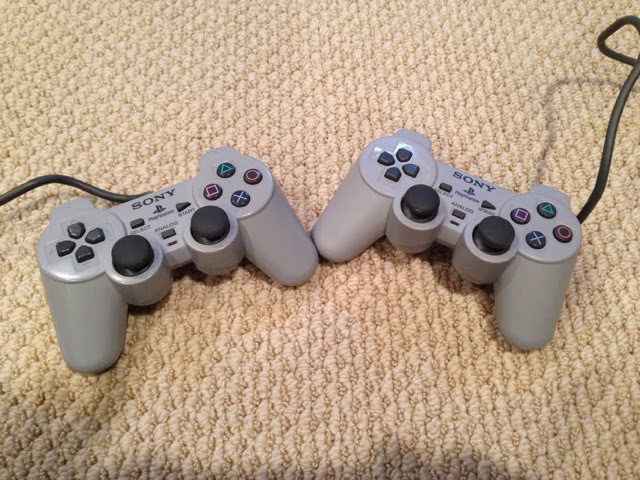 Pic original PS1 controller and new, original on the right. So a couple of weeks ago I splurged a bit and picked up another PS1 at my local retro gaming store. This is one of the older units and is a darker grey then my original, I can tell since I kept my original PS1 controller at least. It works pretty well but I do see what everyone is talking about with the disk speed of the PS1 in comparison to new systems. The only other issue is that the PS1 controller I got with it is crap and will just stop working from time to time. Luckily, I have that original PS1 controller, and some PS2 controllers to use with it if need be. As for games I picked up Gran Turismo, and Gran Turismo 2 the day I got the new unit, and I got 007 Racing off eBay too which is an ok game. Of course being a true retro gamer I want to experience certain games on their original system, so I am looking for titles to play in their original form. Some suggestions I have heard are any of the Army Men games, any of the Colony Wars games, Return Fire, Crazy Ivan, and Tomb Raider. That all look pretty good. So what PS1 games would you suggest? Wipeout.. You have to play it.